Share with us the energy of your voice! ...consider joining Easton Choral Arts Society! We are always looking for dedicated new singers of all ages! Easton Choral Arts Society was created to bring quality choral music to the Eastern Shore of Maryland, and to provide local singers with the opportunity to enhance their musical knowledge and skills in an atmosphere of joy and camaraderie. Our purpose is to enrich both the appreciation and beauty of choral music within the community and within ourselves through practice and performance. 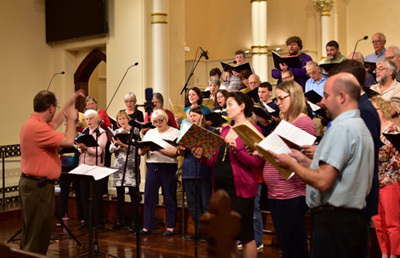 ECAS is a recognized mixed chorus of volunteer singers who seek to present the finest choral classics in concerts of high artistic quality to a growing regional audience. We present three annual concerts, one in the fall, a Christmas Program in early December, and the final season concert in spring. Interested singers should have prior musical study and choral experience and will be voiced and placed accordingly. Annual membership dues are $100. Scores from our music library are on loan to the chorus for each of the three practice/performance periods. During the season, rehearsals are held Tuesday evening from 7:00 to 9:00 pm, at Christ Church Easton. Auditions are scheduled by appointment and interested singers should fill out the form below.